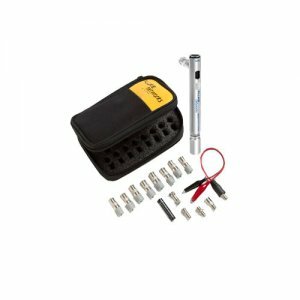 The Fluke Networks PTNX8-CABLE Pocket Toner NX8 Cable Tester Kit is an advanced and versatile Pocket Toner tool tests VDV cables 8 times faster for continuity, AC and DC voltage (low voltage protection and verification up to 52 volts), opens, shorts, 50-75 Ω termination, and polarity with optional Dial Tone Detective adapter. It has all the features of the NX1 and NX2 including the ability to test eight outlets at once. The eight segment LED display shows if a short exists, if there is an open circuit, AC or DC voltage (up to 52 volts), simple, direct continuity or which of the eight ID caps matches the line being tested.